“I’m done…whatever you want to call it”. In the last off-season Werth signed with the Seattle Mariners but never made it to the big league team playing for Tacoma in AAA. Werth debuted in 2002 with the Toronto Blue Jays where he played for two seasons in a reserve role, eventually moving to Los Angeles where as a Dodger he showed promise. In 2006, a wrist injury would force him to miss the entire season and afterwards would be signed by the Philadelphia Phillies. Werth would be named an All Star in 2009 and that year he would help the Phils win their second World Series Championship. In 2010, he would lead the NL in Doubles and finished eighth in MVP voting, the highest of his career. 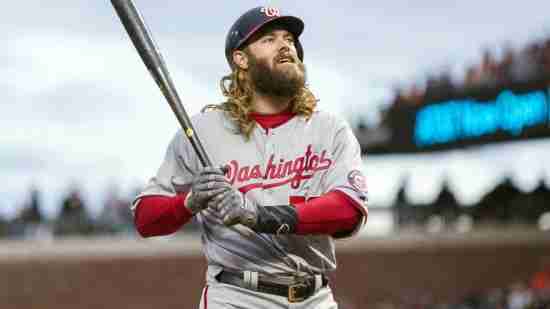 Werth retires with 1,465 Hits. He is not going to get into the Baseball Hall of Fame, but perhaps he has done enough to be placed on the ballot. That would be 2023. We here at Notinhalloffame.com would like to thank Jayson Werth for the on-field memories and we wish him the best in his post-playing career.